Eileen Fisher tee in slubby jersey knit. For in-store inquiries, use sku #2634692. AG Adriano Goldschmied "Henson" T-shirt in jersey with vertical seam detail down center back. Approx. 22"L down center back. Banded V neckline. Short sleeves. Pullover style. Cotton. Machine wash. Imported. Model's measurements: Height 5'10"/177cm, bust 33"/84cm, waist 25.6"/65.2cm, hips 35.8"/91cm, dress size US 2-4/FR 34-36. Eileen Fisher ministripe tee. Mandarin collar; three-button placket. Full shoulder coverage. Shirttail hem. Pullover style. Organic cotton. Machine wash. Made in USA of imported material. 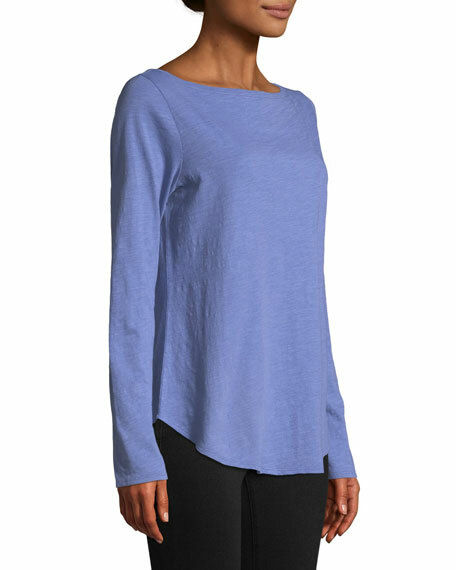 Eileen Fisher slub jersey tee. High, bateau neckline; overlapped back. Three-quarter sleeves. Semi-fitted silhouette. Curved, high-low hem. Pullover style. Organic cotton. Machine wash. Imported. Eileen Fisher cross-dye striped top. Boat neckline. Bracelet sleeves. Dropped shoulders. Boxy silhouette. Organic linen. Hand wash. Imported. Model's measurements: Height 5'10"/177cm, bust 33"/84cm, waist 25.6"/65.2cm, hips 35.8"/91cm, dress size US 2-4/FR 34-36.